Variety is what makes Rainbow Gallery great! Why settle for plain wool or cotton? Stitching is much more fun if you have the ideal thread for each area of your project. Your finished work will be even more beautiful! 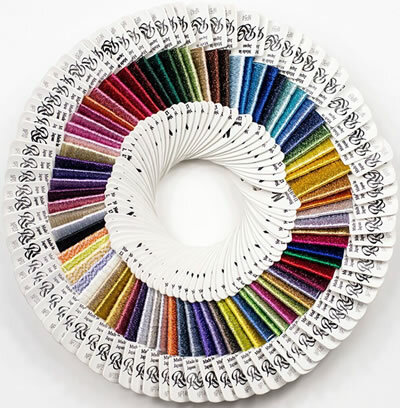 Rainbow Gallery offers you a far wider stitching palette than any other thread company. We searched the world for out-of-the-ordinary threads and brought them to you on convenient bobbin cards. Rainbow Gallery’s threads come from mills in a dozen countries as well as our own facility in Los Angeles. Rainbow Gallery threads are available in most US and Canadian needlepoint and cross stitch shops (not in chain stores). Our threads are exported to over 20 other countries, giving people all over the world an opportunity to use these specialty threads. Located in Burbank, CA, Rainbow Gallery was started in 1979 and has remained an independently owned company.